What did the nut say to his buddies as he left the cocktail bar? Realising that I was slouching on my stool, I made an effort to straighten my spine. 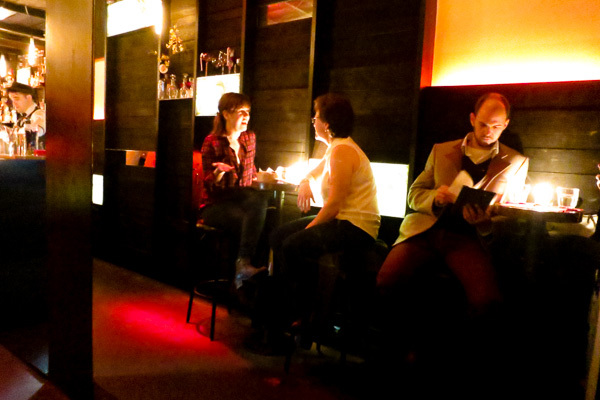 A minute later, I spotted my reflection in the mirror, his posture once again failing as he leaned with his right elbow on the bar table, which was bolted to the floor. The tabletop was a slice of a tree trunk with a jagged split that had been filled with translucent resin. Red LEDs glowed through from below. Sitting in this atmospheric cocktail bar in Vancouver’s Chinatown during my first ever “online date”, I had no idea that my mind was about to be blown. My date pulled out her iPhone. Swipes, scrolls, and taps followed in quick succession, and before I knew it the screen was facing me and I gripped my chin in pain from my jaw having dropped so hard. What, you may wonder, could be so amazing? She showed me a series of photos of cashews from a trip she’d made to Brazil. 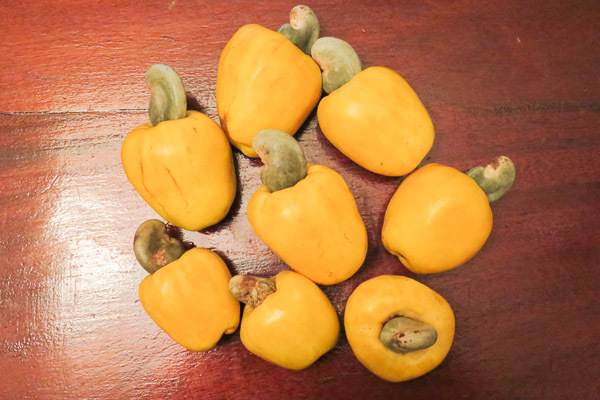 In all these years of eating cashews, I never knew that they grow out of the bottom of cashew apples. 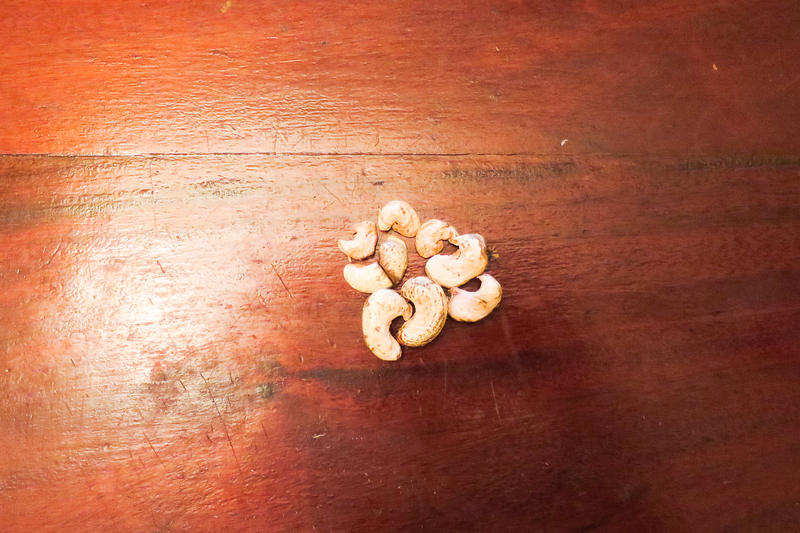 Wrapped in a green protective casing, a single cashew nut clings tightly to the bottom of each cashew apple. 48 days later, I was sitting in the passenger seat of a Land Cruiser pickup somewhere between Kissidougou and Kankan, in northeastern Guinea. Red dust shot out and upward from the tires; billowing clouds lost their definition almost as soon as they formed, leaving a thick, rusty fog in our wake. A small orchard of unfamiliar trees on the left hand side of the road caught my attention, but it was out of sight as soon as I’d noticed it. No more than five minutes had passed when more of these trees came into sight, lining both sides of the road for hundreds of metres. This time, it was impossible not to notice the yellow fruit on the trees: cashew apples! Two nights later, I paid 40 cents Canadian (about 32 cents US that day) for eleven cashew apples, and 45 cents Canadian for four mangoes. 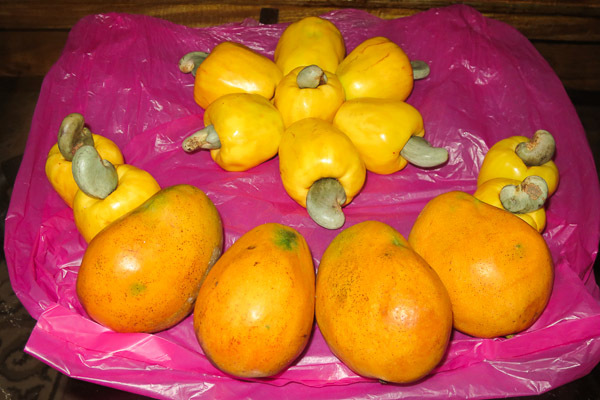 I downed five cashew apples and a mango in one sitting, even though I was stuffed from a large dinner. 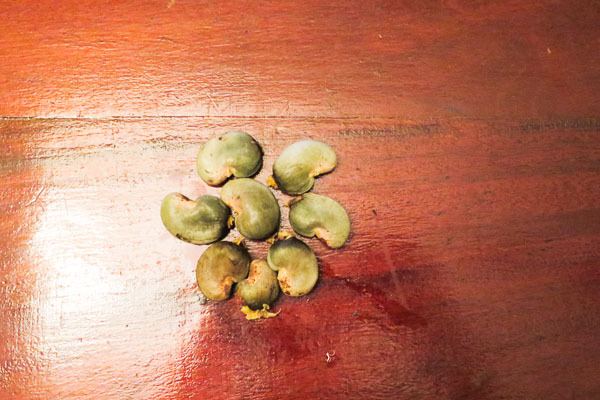 Next, to gain a little perspective on cashew nuts, I spent half an hour fumbling with my Leatherman to get them out of their protective casings. 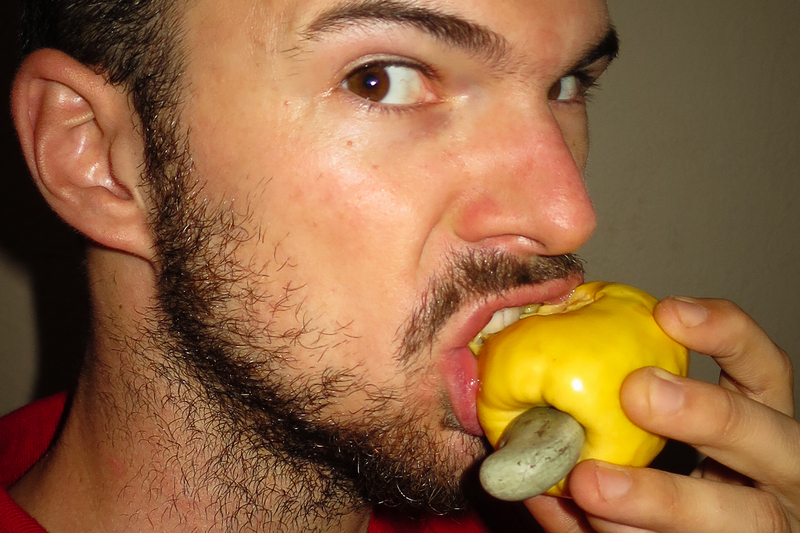 In case you ever find yourself face to face with a real live cashew apple, here’s a protip: don’t consume any milk products before or afterwards. I haven’t yet verified whether this is a legitimate problem, but when he was in the Gambia, my friend Zack (who insists his name is not spelled with a “k”) was told that combining dairy with cashew apples is a recipe for a gastric disaster. My Guinean colleagues told me the same thing, without any prompting. I’d be interested to hear from anyone who might be able to shed some light on whether such a reaction really results from mixing milk and cashew apples, or if it’s perhaps a folk tale serving another purpose. This entry was posted in Africa, Guinea and tagged Cashews, Food fun, Haute Guinée, Online dating. I don’t know about combining with milk, but I understand people who harvest cashews can become sensitive to the outer rind. 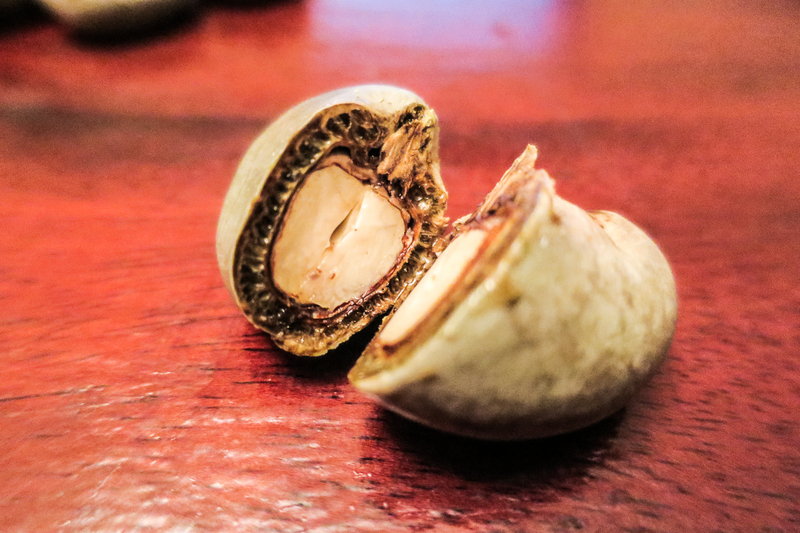 Any cashews are great, but freshly roasted ones are out of this world! Thanks for the heads up! They look delicious. Are the apples good? What do they taste like? Yeah, my hands actually reacted and over the next few days the skin turned leathery and a thick coat peeled off. Seems the oil is quite tough stuff! Thanks for the comment Daniel! They’re tasty, but in a strange sort of way… they smell very sweet, but the taste isn’t too strong. It’s almost like sweetened water, not quite juice. The skin has a rubbery texture and it’s actually a bit hard to get through it with teeth even though it’s soft, so the whole thing gets a bit mashed up as I try to eat one. Maybe cutting it up into small pieces with a very sharp knife would make it a bit easier.